These petite puffy pancakes, made with a mixture of buckwheat and regular flours plus yeast for a fluffier texture, are a classic Dutch treat. They are often sold from street stalls in Amsterdam and are baked in a special poffertjes pan, which has about a dozen or so tiny indentations. They are a terrific choice for Sunday brunch, a lazy lunch, or a comforting dessert. What to drink with these mini pancakes? Coffee, of course -- no contest -- whether you take it strong and black or loaded up with sugar and cream. The Netherlands tops the list of coffee consumption per day, with the U.S. trailing way behind at No. 16, according to a Quartz.com survey of coffee drinking around the world. This easy recipe is just about foolproof and offers two choices for tasty toppings: the traditional option of melted butter with sieved powdered sugar or the glammed-up version of strawberries and whipped cream. Note: while there are multiple steps to this recipe, this poffertjes dish is broken down into workable categories to help you better plan for preparation and cooking. Dissolve the yeast in 1 tablespoon milk in a small bowl. In a separate bowl, combine the buckwheat flour, white flour, eggs, sugar, salt, half the warm milk (5/8 cup), and the yeast and milk mixture. Whisk the ingredients until the mixture is smooth. Add the remaining warm milk and beat again. Cover the bowl with plastic wrap and allow to rest for an hour. Melt 1 tablespoon butter in a frying or poffertjes pan. When the butter starts to sizzle, add teaspoonfuls of the batter in circular movements to create the mini pancakes. 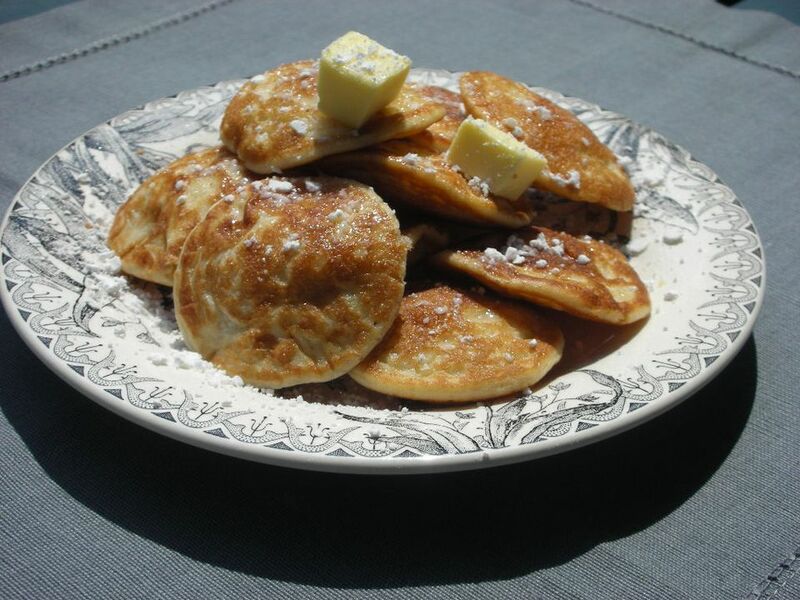 Serve the pancakes with the best quality butter you can find and sieved powdered sugar. For a sweeter treat, serve these mini pancakes with strawberries, whipped cream, and a dusting of powdered sugar. If you happen to have a poffertjes pan (usually a cast iron pan with a dozen or so indentations) this is the best pan to use for this recipe. But if you do not have one, a regular skillet works fine.